Today, San Francisco is one of the top tourist destinations in the world, ranking 33rd out of the 100 most visited cities worldwide, and is renowned for its chilly summer fog, steep rolling hills, eclectic mix of architecture, and its famous landmarks, including the Golden Gate Bridge, cable cars, and Chinatown. The city is also a principal banking and finance center, and the home to more than 30 international financial institutions, helping to make San Francisco rank eighteenth in the world's top producing cities, ninth in the United States, and ninth place in the top twenty global financial centers. Tourism is the backbone of the San Francisco economy. 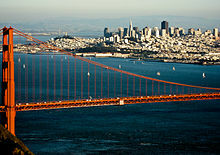 Its frequent portrayal in music, film, and popular culture has made the city and its landmarks recognizable worldwide. It is the city where Tony Bennett "left his heart," where the Birdman of Alcatraz spent many of his final years, and where Rice-a-Roni was said to be the favorite treat. San Francisco attracts the third-highest number of foreign tourists of any city in the U.S. and claims Pier 39 near Fisherman's Wharf as the third-most popular tourist attraction in the nation. ^ Finz, Stacy (July 16, 2006). "Rice-a-Redux After a 7-year hiatus, it's billed once again as the San Francisco treat". San Francisco Chronicle. Hearst Communications. p. A-1. Retrieved June 15, 2008. This page was last edited 12:00, 2 November 2018 by Wikipedia user Deskana (WMF). Based on work by Wikipedia users Jdlrobson, Maryana, Maryanasock22, Maryanasock10, Maryanasock, Maryanasock3, Selenium user, Kaldari, Awjrichards, Noob, Mgrover(WMF) and Dragonh4t and Wikipedia anonymous users 198.73.209.2, 124.30.145.122, 92.235.48.65, 217.220.32.103 and 203.209.78.90.